Garmin’s latest wearable, the Vivofit band, is available to buy exclusively from John Lewis today here in the UK for just under £100. 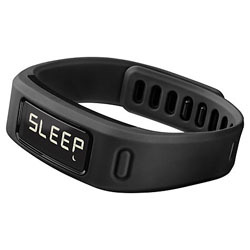 The band is a pretty decent competitor when it comes to both price and features in a space filled with Jawbone and Fitbit devices and the Nike+ Fuelband. The Vivofit presents all of your daily activity on a 25.5mm X 10mm curved display and can monitor the steps you’ve taken throughout the day, the calories you’ve burned, the distance you’ve covered and how well you sleep on a night, presenting you with tailored goals to (hopefully) improve your activity levels and keep you motivated. The Vivofit syncs up with Garmin Connect, adding in the tried and tested community and competition element to the device, allowing users to earn virtual badges and see how their progress measures up to their mates. The band itself looks a little plastic-y, but overall its very subtle and wearable day-to-day and is also waterproof up to 50m, which means you don’t need to worry about taking it on and off every time you wash your hands or shower. The band is available from John Lewis for £99.99 in a range of colours – we like the grey for those after a subtle option that’ll go with everything and the purple if you’re feeling a little more bold and want the device to stand out.